Yes, 'tis is the season of the Christmas tree but lately the My Cute Stamps keep demanding my attention and since many of them have never seen the light of day I thought I should indulge them. I love this simple tree image. I embossed it and coloured it with Copics and added some Glossy Accents to the heart. The sentiment is from Freshly Squeezed Stamps (sadly also defunct) and I'm loving the look of sentiments highlighted on a dark strip of cardstock - it really makes them pop! What a sweet card! Perfectly coloured, too. Adorable, love the little heart!! Well I just LOve your darling tree, Jen!! Apples should be heart shaped, don't you think? I do! I love this, Jen. I will try with small images stamps one day to create a tree too! :) Thank you for the lovely inspiration. This tree is adorable, and I do like your sentiment trick. It definitely stands out. Yep! Totally agree! The sentiment definitely pops on that strip of black, and I absolutely adore that tree with its pop of red! Oh, I just love the heart in the tree, what a fab card Jen! 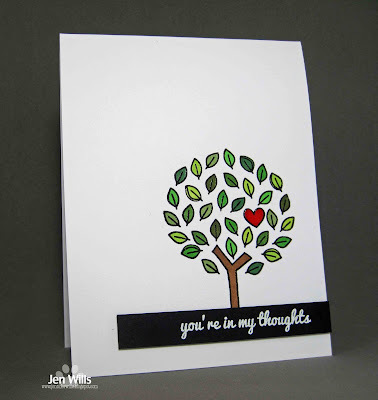 Jen, I love this tree and the clean embossed sentiment on black card stock. 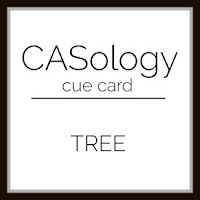 You rocked this week's cue! What a simple and beautiful card! Love it! Hey Jen!! I love the simplicity of your card. Your tree looks great.